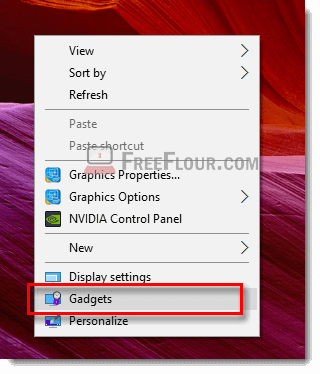 Simple tutorial on how to add desktop sidebar gadgets in Windows 10. Popular gadgets such as CPU meter, Network meter, Handy Notes, Calender. The old-school sidebar gadgets we once used in Windows 7 had always been our companions to help checking our CPU activity, network bandwidth, GPU and HDD usage, clipboard history, handy note, graphical clock, etc directly from the desktop. 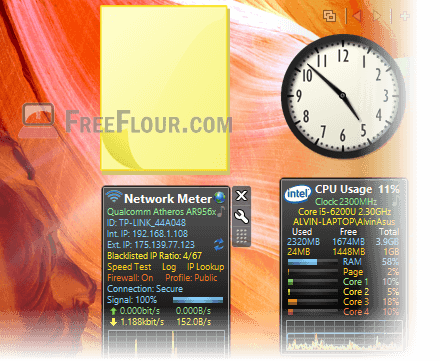 The tutorial below will show you how you can bring back this feature and be able to add desktop sidebar gadgets in Windows 10 (such as CPU meter and Network meter). For some reasons, ever since Windows 8, the feature was completely removed from the Windows series. A lot of us have been struggling to figure out a way to bring back the feature. Fortunately, there is a fan-made software called 8GadgetPack which makes it possible to add any sidebar gadget to Windows 10. 8GadgetPack was developed by Helmut Buhler and can be downloaded at his website 8gadgetpack.net. This awesome software is free to download and use but you can donate to the developer on his website as appreciation of his work. Go to 8gadgetpack.net, download 8GadgetPack and install it. Once installed, right click anywhere on your desktop. Select Gadgets. Most of the popular gadgets are already pre-installed in 8gadgetpack. Drag any gadget you like to any location on your desktop you prefer. You should find most of the previously common sidebar gadgets that were once popular in Windows 7 available in 8gadgetpack. 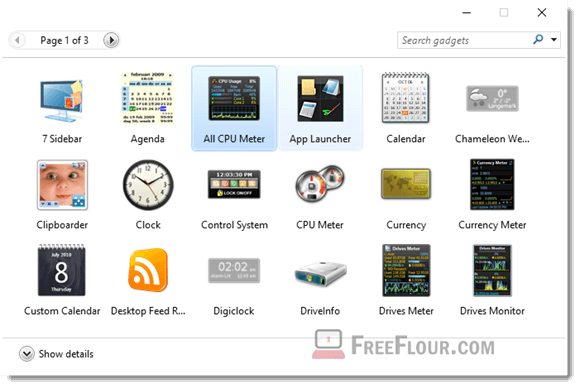 For example, the well known All CPU meter, GPU meter, Network meter, Calendar, Clipboarder, customizable clock, currency meter, weather gadget, launch control and sticky notes online. With the help of 8gadgetpack, you can install any sidebar gadget as long as it’s compatible with the legacy Windows 7 sidebar. If you are looking for a specific gadget that were not included in 8gadgetpack by default, you can Google search the specific sidebar gadget, download and install it. It will then appear in the 8gadgetpack window. You can find most of the sidebar gadgets from popular Windows 7 gadgets fan made websites such as win7gadgets.com and win10gadgets.com. It’s worth noting that you might also risk downloading malicious sidebar gadgets that contain viruses or malwares if it’s from a website that is not well known. Be sure to have an antivirus software protection running in your Windows 10 before installing any external sidebar gadgets. There are a lot of websites trying to get you to download their fake sidebar gadgets that is not really a sidebar gadget but a malicious piece of malware with the purpose to hack your computer and steal your info. Since Microsoft no longer support Windows sidebar gadget, you have to be very careful when differentiating which are the genuine ones and not to download these fake sidebar gadgets that claims to be genuine. Only download from famous sidebar gadget websites such as win7gadgets.com.